Awesome sauce, I will be in corral 5 if anyone else is in corral 5 would love to chat pre-race! Hit me up @danielleruns on Twitter. Question for you, I am running the half but a friend of mine is running the full. Can I get up onto the viaduct (eek) as a spectator to cheer him on after I'm done? Curious if there were spectators up there last year. Scott and I will be up doing the Dirty Dash with Stacie on 7/9. Are you going to be there? 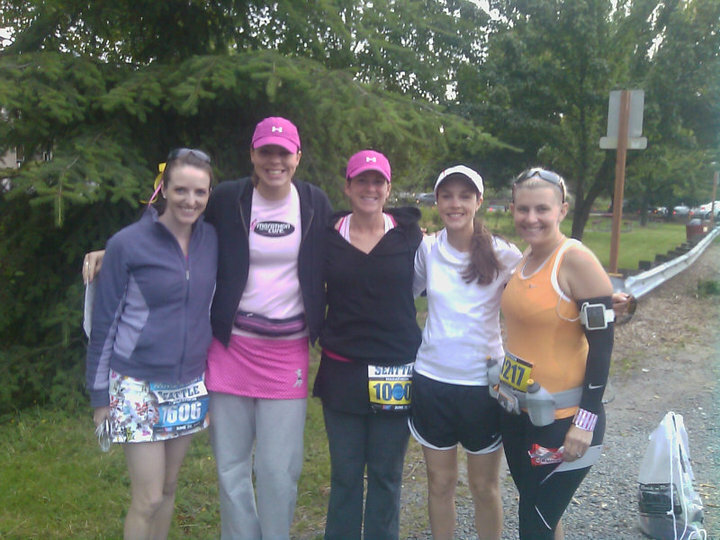 Thanks to your blog, Stacie won the team entry and now, I'm on team "Out for Mud" with her! I can't wait to meet everyone at the RnR dinner!! 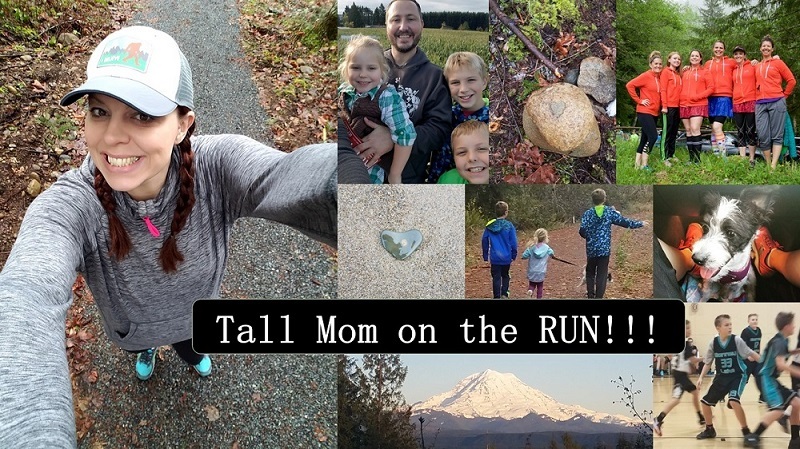 I am running the See Jane Run Boise half this Saturday! I'm super excited and hoping for a sub 2 hour half! And of course extremly excited for Seattle RnR marathon! I am getting so excited to see everyone! Even though my training has not gone as planned, I am just going to enjoy being there! SMILING EAR TO EAR as I remember our awesome weekend last year. Also giggled out loud at our honey bucket "inspections". We had a blast. MISS YOUUUU! And "tomorrows" - I like that!! About two years ago I found your blog. It turns out it was one of the most pivotal events in my running life. True. Story. 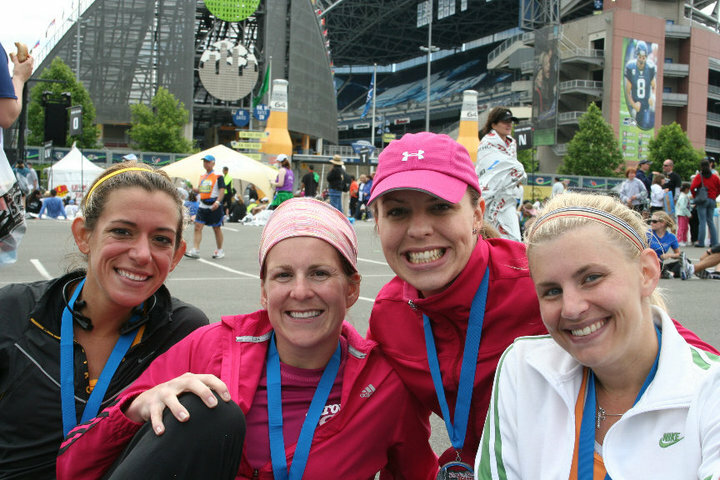 Because I found your blog, read your ~soggy~ race report and took your ~experiences~ to heart, I made EXCELLENT race choices when I ran my first marathon. 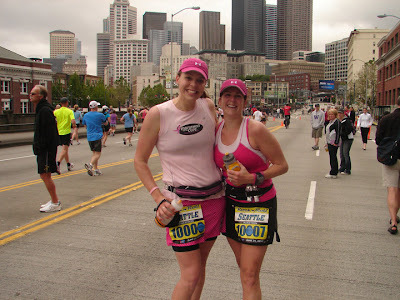 AND Because I made those choices - starting with choosing the BEST TRAINING PARTNER EVER - I had a great race that day and finished happy. I knew I would race a marathon again. And I did. And I STILL LOVE IT. And part of that is because of you. 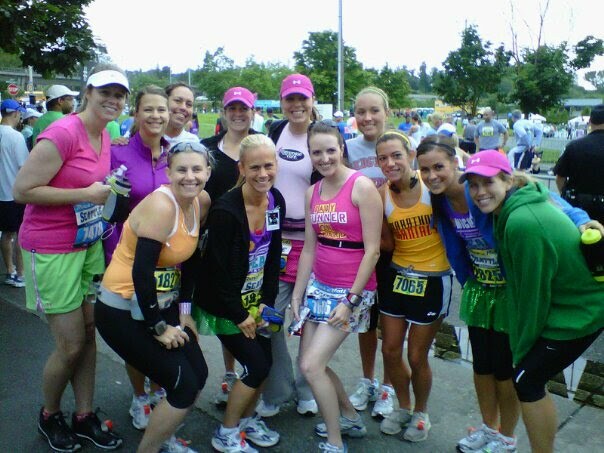 im so jealous you're running rnr seattle! please email the evite or invite with details. can't wait to see everyone and give my tall coach a big hug! It's times like these when I wish I wasn't a East-coastie. Or had a bigger pocketbook to pay to join in the West Coastie fun!! I just ordered a limo for me and 7 friends, so we don't have to take the shuttle. Looking forward to arriving in style! Wish I could meet up with you guys, but I have a wedding the night before (Oh goodie, a wedding with no drinking for me!) I'm only doing the half, but reading your entry still made me feel a little nervous! It'll be a great day!! Good luck and have fun! Thanks for the shout-out MEL! I'm really grateful you and the ladies are organizing a gathering. It will be so reassuring to be surrounded by "experienced women" (ahem!) the night before the race. I'm nervous & excited. Looks like fun! Maybe I'll make it for next year! Unfortunately I've got a dentist appointment coming up, tomorrow morning at 8.30. I'm not so much excited as petrified. Dentists scare me. They make me feel like running really fast. 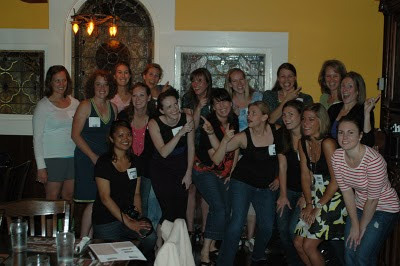 Lots of bloggy love to be had next weekend! Can't wait to meet everyone and experience my first RnR event! See you in 4 sleeps! I sincerely hope you and the others will do Seattle again next year... I was jealous of the gathering last year... couldn't make it this year, but I'm 99% sure that I'm commiting to it for next year.